Numbers don't tell whole story in Hellebuyck's case so far - The Point Data-driven hockey storytelling that gets right to the point. With their star players rounding into form as the first quarter of the season nears completion, the Winnipeg Jets are starting to look closer to the team we all saw dominate the league last season, and while they were figuring some things out, they’ve still managed to win about 65 percent of their games. One of the areas that on the surface that has looked a little bit weaker than last season has been goaltending, namely Connor Hellebuyck, who after a breakout season last year where he stopped 92.4 percent of all the shots he faced, he’s been far below that until recently. The last couple weeks Hellebuyck has looked fantastic, but his numbers earlier in the season had me wondering how much of that was actually on him? Hellebuyck last year was excellent, but a big part of what allowed him to put up those excellent numbers was the Jets’ ability to cut down dangerous chances. No team allowed fewer scoring chances against with a pass immediately preceding it at 5-vs-5, for example, whereas this year the Jets have been closer to league average overall. 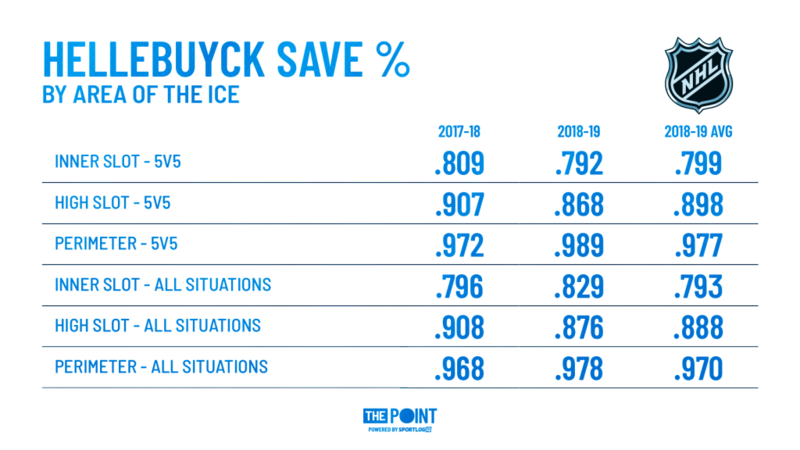 As I mentioned in a previous article, the Jets are also giving up more chances off the rush than last season, so Hellebuyck has been facing a significantly more difficult set of shots than he has before, so the overall save percentage may not be reflective of his actual performance. Luckily, we can break down Hellebuyck’s save percentage based on where on the ice the shot came from, simultaneously comparing it to the league averages this year, and himself last season. Based on the data, we have two different stories here with Hellebuyck. His save percentage on dangerous shots at even strength is down from last season, and also lower than league average. His high danger save percentage is just 0.7 percent lower than league average though, so I don’t think that’s anything to worry about. Most passes into the slot that are immediately turned into scoring chances are from the high slot, so it makes sense that the area where he’s seeing the biggest change in shot danger is where his save percentage has been hurt the most. While the save percentage for Hellebuyck is down from there, I’m slightly skeptical that his personal performance is to blame for this. Also of note, is that both at even strength and all situations, Hellebuyck isn’t giving up weak, perimeter goals, which is huge for the Jets, a team that has been good at protecting the slot in the past, and likely will be again. If they can protect the only areas where Hellebuyck is weak, on a relative scale, they’re golden. Then, of course, there are the all-situations numbers, which are usually worse than the 5-vs-5 numbers, but Hellebuyck has actually provided the Jets with better performance on special teams than at even strength. Specifically from the high danger area, Hellebuyck has been brilliant, stopping 82.9 percent of the shots he’s faced from there overall, and outside of 5-vs-5 hockey, he’s stopped 90.9 percent of high danger scoring chances, which is unbelievably strong. For skaters, we can look at shots, passes, entering and exiting zones, puck battles, active defending, and more, but with goalies, we mostly stick to what they deal with in terms of puck movement and shot locations, and how they deal with those factors. Unfortunately, it makes analysis of the position tougher to rely on, but based on the little bits of extra information we do have, we can see fairly clearly that overall save percentage doesn’t always give us an accurate reflection of the performance of the goaltender. Based on the shots he’s facing, and the passes that precede those shots, you could make a strong argument that Hellebuyck overall has been just as strong of a goaltender this year as last year, despite a drop in the numbers on the surface. One thing remains consistent with Hellebuyck though, he doesn’t give up weak, momentum-sapping goals. 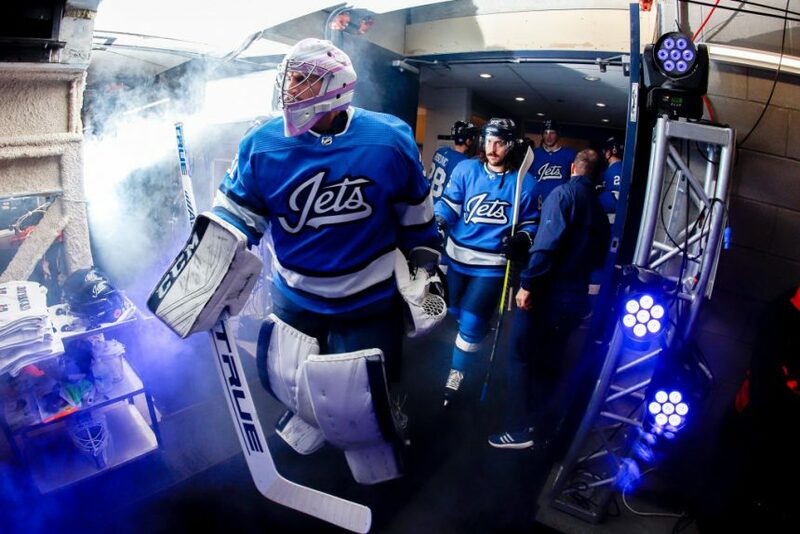 When he’s in goal for the Jets, they aren’t guaranteed that he’ll win the game for them on his own, but he won’t lose it for them, and that’s an extremely valuable quality, often the main one coaches want.